Are youor people in your small groupfacing situations that seem impossible? Youre not alone. In Believe Dr. George O. Wood leads readers on a journey of discovery as he shares four biblical examples of people who chose to believe God despite seemingly insurmountable challenges. By studying the lives of Sarah, Naomi, Hannah, and Mary, you will be inspired to believe God for greater things in your own life, too.Each session of this 112-page guide includes opening conversation starters, video response questions, Bible passages for deeper learning, daily devotionals, and more. Also included are tips for new leaders and helps for building a healthy small group ministry.Coordinates with the Believe forGreater Things Small Group Kit or DVD. George O. Wood is the chief executive officer of the Assemblies of God and chairman of the larger World Assemblies of God fellowship. As General Superintendent of the Assemblies of God, USA, he is a member of the denominations Executive Leadership Team and Executive Presbytery. He is also the author of numerous books including Living in the Spirit, A Psalm in Your Heart, Living Fully, and The Successful Life. 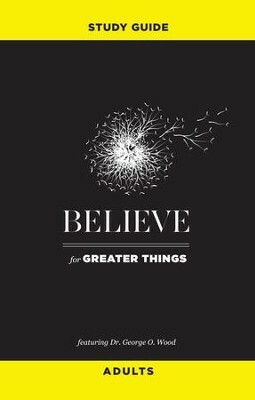 I'm the author/artist and I want to review Believe for Greater Things Study Guide: Adults - eBook.